The Heights of Dargai commemorates an important Battle Honor of the Gordon Highlanders, now part of The Highlanders (Gordons, Seaforths & Camerons). Dargai is in northwest Pakistan. Dargai is very famous for its battles during British rule. During the summer of 1897, along the Northwest Frontier of India, various tribes had fielded a force of close to fifty thousand men to harass and and destroy British forts and villages. When they captured the Khyber Pass in August, the British Government decided they must be removed. The Army immediately fielded two Divisions to engage them. The campaign climaxed on October 20th with a Brigade under cover near the base of the heavily manned cliffs leading up to the Dargai Plateau. 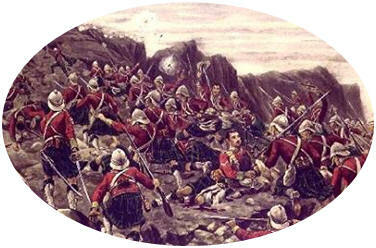 The Gurghas were the first to attack but were pinned down at the base of the cliffs. The Dorsetshire Regiment followed a couple of hours later and were also pinned down. Then the Gordon Highlanders, led by their Colonel and pipers, along with the 3rd Sikhs, rushed the open and murderous fire and won the heights in forty minutes. They left three officers and thirty men killed or wounded along the way. During the battle, Piper Private George "Jock" Findlater, wounded in both feet, is shown continuing to play marches to encourage the troops during the fray. For this he received great acclaim at the time and a Victoria Cross from the Queen.